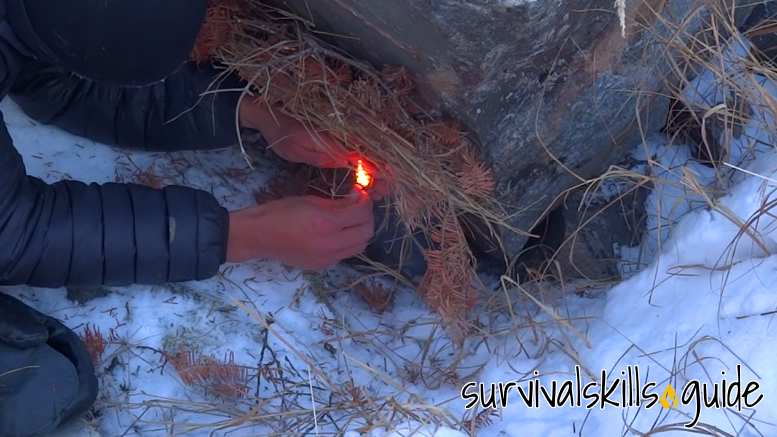 Being able to start a fire during an emergency in difficult conditions is a very important survival skill. Starting a fire with only one match is a good way of practising that. The temperature was -10°F, or -27°F with windchill. 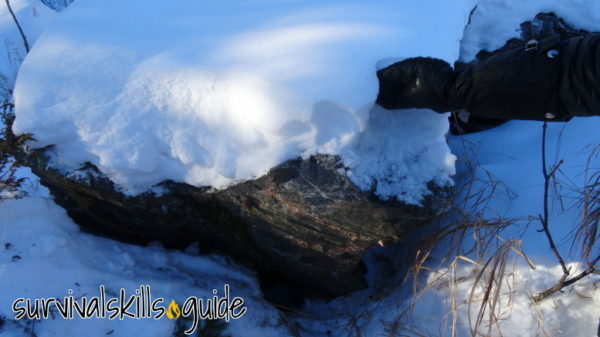 If someone fell through the ice into the frigid water and managed to self-rescue, she would have to change into dry clothes immediately and get into a hypothermia burrito wrap. Otherwise the other options are to keep moving until she reaches shelter or start a fire. You need appropriate quantities of those elements for a fire to stay lit. If your source of heat is small like a match, then your fuel must be small like a pencil lead. Once a fire gives off lots of heat, then it is capable of consuming bigger fuel. It helps a lot to be gradual with the size of fuel. 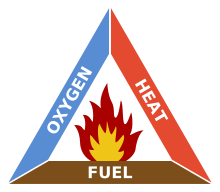 Also a fire gets smoky when it doesn’t have enough oxygen, and a steady flow of oxygen helps it grow. 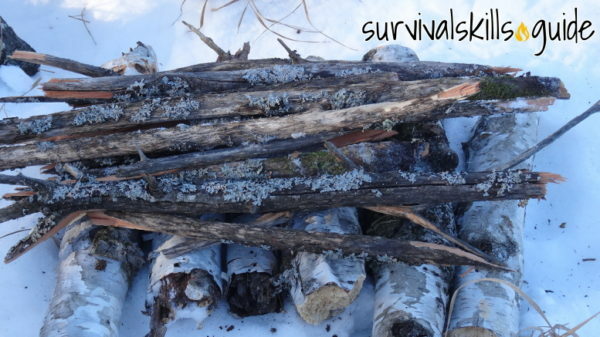 I find most beginners focus on building a tipi fire layout for their one match fire, but having lots of tinder, kindling, and fuel at hand ready to be placed over the fire when the time comes is more reliable and an easier way to learn how to gradually feed a fire. 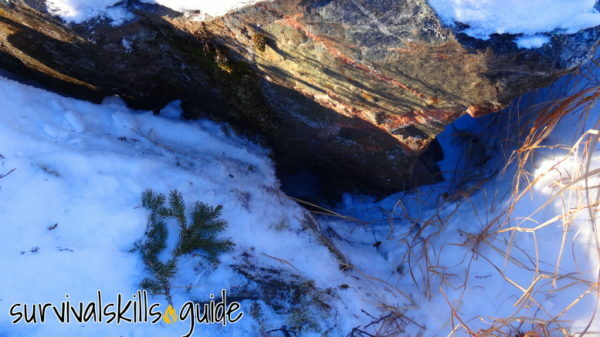 Find a location sheltered from the wind, yet close to tinder, kindling, and fuel. You don’t want the wind to blow off your match. If you can’t find a sheltered spot and there is not much wind, then you can try kneeling with your feet together with your back towards the wind. I found a bunch of big rocks that offered a sheltered place where I could light my tinder bundle. Shake any snow or rain from branches above you. It could fall over your match or tinder. Gather dry fuel thicker than your wrist, and place it nearby. Gather thin fuel as well, anything wider than your finger. 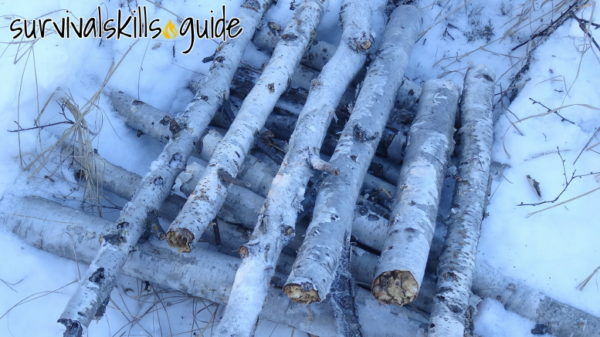 Gather lots of kindling, generally the driest kindling is farther away from the ground. 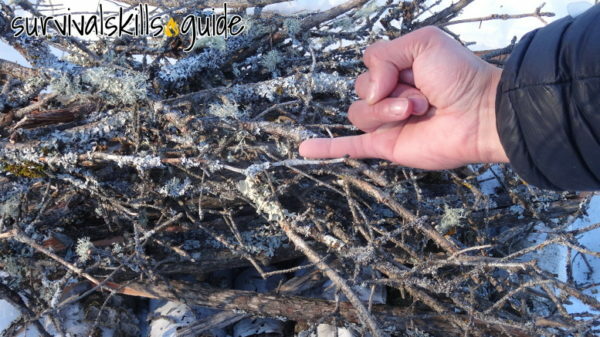 Kindling is anything as wide as pencil lead up to finger wide. Place it over the fuel so it doesn’t absorb moisture. Gather dry tinder. 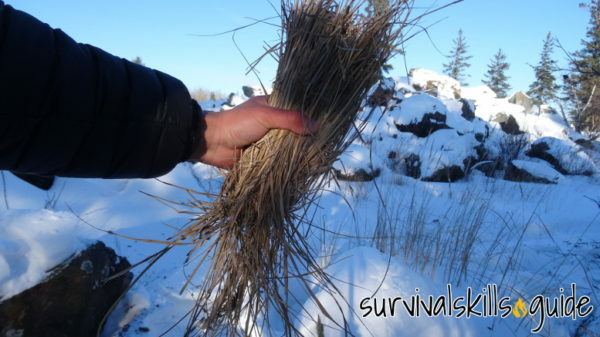 Grass, birch bark, shredded inner bark, very thin sticks, and red pine needles make good kindling. 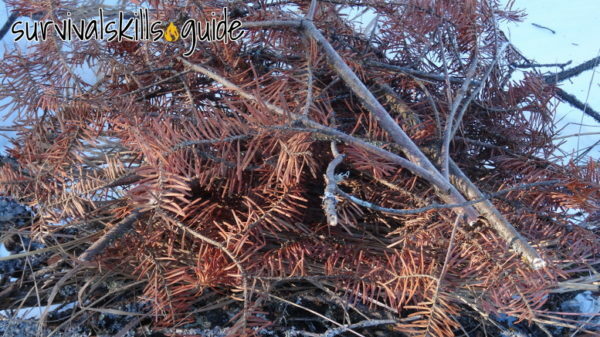 Many people fail to start a fire with only one match because they don’t gather enough dry tinder, so gather lots. If everything is wet and you can’t find dry tinder under logs, you can carve shavings out of dry wood. Usually wood at the core remains dry. It’s always best to combine two types of tinder of different thickness because otherwise it can light up too quickly without starting a chain reaction; this often happens with grass or cattail fluff. Red pine needles are one of my favorite types of tinder because the resin inside them makes them work even when damp. It’s always worthwhile to look for a bunch of it for your tinder bundles. 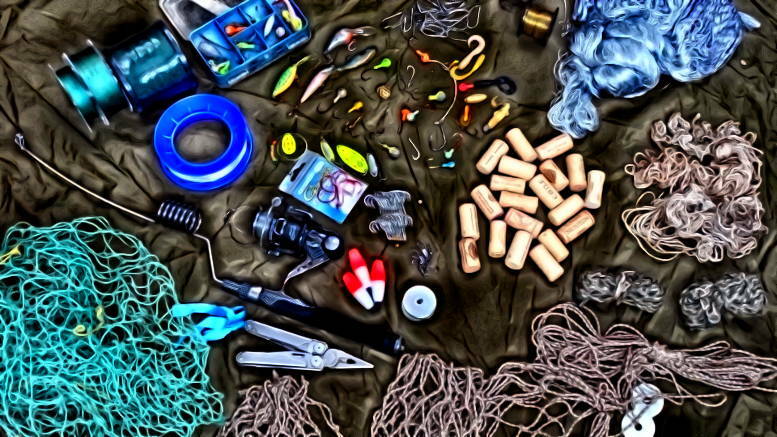 Make sure all the materials are at hand, and get your matches ready. Try to strike the match very close and underneath your tinder bundle. You can also build a platform for that purpose. Grab the match close to the head, you’ll have time to move your finger once it lights. And it will be less likely to break. Once the match catches on fire turn its head downwards to fully burn the match while you light the tinder. Avoid sudden movements. Put back your matches in one of your pockets, so you don’t lose them or get them wet. In cold or wet areas starting a fire with one match can be difficult, so I carry a lighter instead. Stormproof matches are another good option for they give you a much longer burn time and remain lit even if quickly submerged in water. If you have a friend who would find this article useful, please share it with them. Thanks! 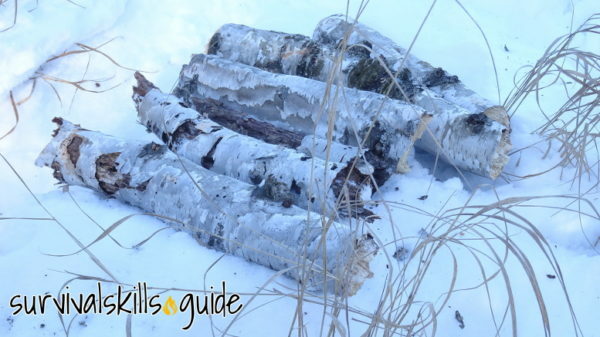 Be the first to comment on "How to Start a Fire with Only One Match in Difficult Conditions"